Trying to nurture my inner earth mother… as a city girl. This summer, I totally got on the succulent bandwagon. 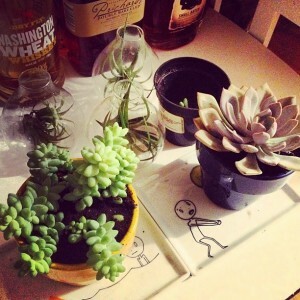 Let me explain, I didn’t actually know what succulent plants were. (In botany, succulent plants, also known as succulents or sometimes fat plants, are plants having some parts that are more than normally thickened and fleshy, usually to retain water in arid climates or soil conditions. A common succulent plant is Aloe Vera, for example. A lot of times they were mistaken as “cacti,” but it’s actually not the case.) Ryan and I were in wholefoods, and saw the little succulent (On the right in the blue planter – an echeveria). We were charmed by it. They were having a sale, I think I bought it for something like $2-4, I forget. After I added to my collection I decided to replant the succulents I had (at this time I had the burro’s tail trailing one) into colorful blue and yellow planters. The first picture is from this time. I also topped off my collection with 4 air plants in globes. The small container above the echeveria was it’s original container, which it outgrew. There were some small burro’s tail, that I wanted to separate and cultivate on its own in that container. Now, I have a couple of different “nurseries” going. You can see the growth of the plants compared with the first picture. The top right is a pepper plant that I got from Las Vegas that I am trying to incubate with no luck. 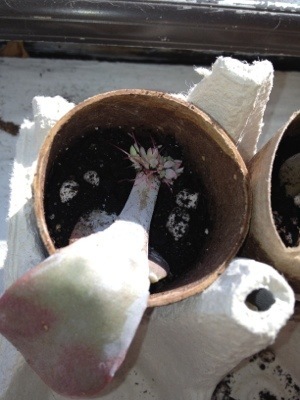 Below is the little burro, which is growing at a snail’s pace with some additional echeveria cuttings. To the right of that is my original echeveria plant with a child (a little hidden) in the top. I might separate the two in the near future. To the right of that is my “nursery” of echeveria cuttings. 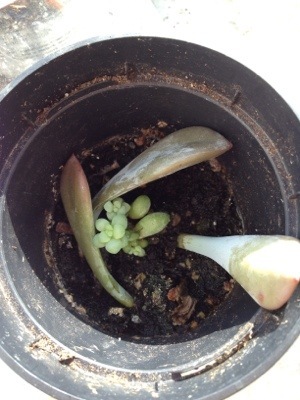 One is really propagating (below), so I am looking forward to that. I made the little containers by cutting a toilet paper spine in half, cutting snippets of the bottom, folding them in, putting in soil, and leaving the cutting on top (once the roots grew out). This way, when I am ready to plant them, I can put the whole thing in soil, since it’s biodegradable. I also used half an egg carton to drain the water. 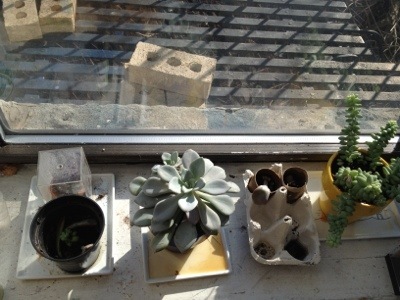 To the very right is my burro succulent, which is doing ok, but growing very very slowly. On the left, you can see the little burro surrounded by echeveria cuttings that sprouted roots. They are pretty firmly planted in the soil, although you wouldn’t be able to tell by looking. On the right, you can see one really growing a little child at the end of the cutting. (This is tiny and in the toilet paper planter.) I am hoping to grow the $4-6 investment into several small little plants that will eventually grow on it’s own. If I can do this, anyone can. Given their hardiness, cuteness (so plump, not flowery, and adds greenery) you can see why it’s so trendy now. For me, I think they are just aesthetically pleasing, and they seem to like me. :P It’s very forgiving, low maintenance and rewarding. I bought some cactus soil to plant them in, but succulents are very very forgiving. Maybe during the spring I’ll get a new type to add into the family. I like the idea of terrariums, but I’ve been a little gun. I would rather just multiply them, but maybe in the future I can play with the children in different terrarium set ups. Next time we’ll talk air plants!